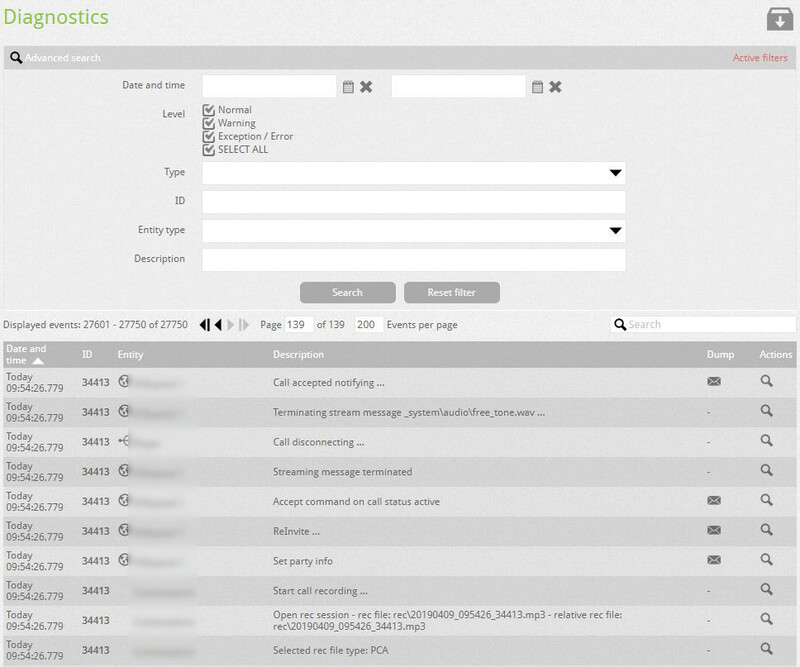 The Diagnostics section, accessible from the Toolbox menu -> Diagnostics, allows access to the switchboard event log and to make a specific diagnosis of the problems. This area can also be accessed from the Call Report. By clicking on the icon it is possible to download the current track while clicking on the icon it is possible to access the complete log file folder. An advanced search is available thanks to specific filters: clicking on Advanced Search you can open the list of filters, through which you can quickly debug problems and incorrect configurations. Level Allows you to filter the level of messages you want to view. Type It allows you to filter the type of interaction you want to analyse. Entity It allows choosing the entity whose interactions are to be analyzed. In this way, even within an entire test call it is possible to select which part of the call affects our analysis.